We’re happy to announce that NaclBox now supports online multiplayer gaming! We have a couple of ways you can choose to play. You can play a public game, and we’ll match you with someone who also chooses to play publically. We will match you with the first person who comes along. But, if you want to play with a friend, you can start a private game too. When you start a private game, we give you a link that you can send to anyone with Chrome and start playing immediately. Multiplayer NaclBox is also available in My NaclBox, so if you’re interested in playing your uploaded commercial games, you can do that too! Even though classic DOS games are renowned for their setup ease (cough), when the game starts up, we will try to automate the configuration of the multiplayer settings with some automation magic. 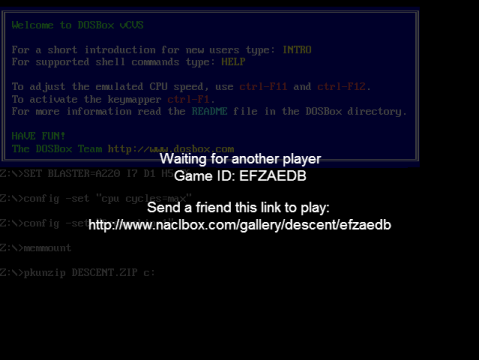 If that fails for any reason, NaclBox multiplayer works on COM1 and acts as a serial modem. If you’re interested in the nuts and bolts, we’re using WebSockets to make all of this happen.